Jay Clayton, a star Wall Street lawyer picked to lead the SEC, has a list of clients that reads like a who's who of companies accused of shady practices. Clayton, who will be quizzed about his ties to troubled companies during his confirmation hearing on Thursday, also represented the very industry he is supposed to police -- he advised Goldman Sachs on its controversial government bailout and Bear Stearns in its 2008 fire sale to JPMorgan (JPM). As a partner at the elite law firm Sullivan & Cromwell, Clayton pulled in $7.6 million in the last year and could make another $1 million when he steps down, according to recently-filed financial disclosure forms. Democrats are already attacking Clayton's extensive ties to the financial industry. They question how he'll be able to keep Trump's promise not to let Wall Street "get away with murder" by now watching over the very companies he was paid to defend. Senators Bernie Sanders and Jeff Merkley are expected to appear at a rally in Washington, D.C. on Wednesday to urge their colleagues to reject Clayton's nomination. Activists have pointed to Clayton's "massive conflicts of interest and cozy relationship with Wall Street." If confirmed, Clayton would oversee an agency charged with protecting investors, rooting out financial crime and ensuring capital markets are fair to all. Clayton would also play a key role in Trump's efforts to rip up what he sees as burdensome regulation from the Obama era. For instance, investors are hoping Clayton's confirmation hearing will make it easier for companies to raise money, in part by relaxing reporting requirements and other rules. The White House didn't respond to a request for comment for this story, but Trump has previously praised Clayton's background as a Wall Street lawyer. When he nominated Clayton, Trump predicted he will help unleash the "job-creating power" of the economy. "We believe this is one of the better Trump picks to run a government agency," Jaret Seiberg, a Cowen & Company analyst, wrote in a report to clients. "He could provide real relief when it comes to raising capital." To be fair, Clayton isn't the first SEC nominee this decade to have a history of defending companies in legal trouble. If confirmed as SEC chief, he'll replace Mary Jo White, a superstar lawyer nominated by Obama in 2013 after years of representing big companies like hospital chain HCA and large banks such as Morgan Stanley. White also successfully defended former Bank of America CEO Ken Lewis against an SEC investigation. But unlike Clayton, White had a long record as a tough federal prosecutor. She led investigations into financial fraud, helped take down former mob boss John Gotti and won a conviction against the terrorists behind the 1993 World Trade Center bombing. Clayton's financial disclosure form filed with the Office of Government Ethics includes a long list of corporate clients from which he's earned more than $5,000 from in a single year. The roster includes Barclays (BCS), a British bank that in December was sued by U.S. prosecutors for allegedly selling shady mortgage securities that left clients with billions of dollars in the hole. Other major clients include Pershing Square, the hedge fund run by prominent Valeant backer Bill Ackman, who recently sold his stake in the controversial drug maker at a massive loss. Clayton has also represented the Royal Bank of Canada (RY) and hedge fund billionaire Paul Tudor Jones. Of course, it makes sense that Clayton has a history of representing major Wall Street players. After all, he's a high-priced lawyer who's been a partner at Sullivan & Cromwell since 2001. Still, Clayton has some clients on his roster that are so sensitive that he won't even divulge who they are. Clayton's disclosure form includes a note saying that four individual clients and five corporate clients are not listed "because the disclosure of the representations are the subject of attorney-client privilege and other confidentiality obligations." Clayton also indicated that two corporate clients aren't detailed because they're the "subject of a pending non-public investigation." It's not clear if those investigations are being conducted by the SEC or other authorities. Clayton is the latest Trump nominee who has deep ties to Wall Street generally, and Goldman Sachs (GS) specifically. 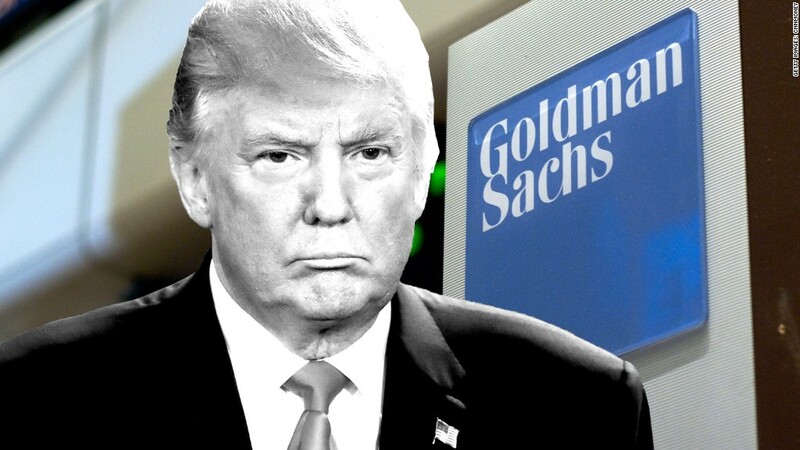 Treasury Secretary Steven Mnuchin was a longtime Goldman Sachs partner and Trump has nominated Goldman exec Jim Donovan to the No. 2 job at the Treasury Department. Gary Cohn stepped down as Number Two of Goldman Sachs to become Trump's top economic adviser.